All said and done, it's a perfect fit and DH loves it! 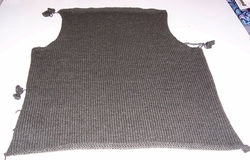 Pattern: Tribal Sweater from Knitting with Balls by Michael del Vecchio (ravelry). 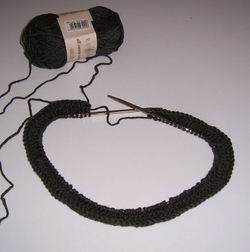 Based on my gauge swatch I knit the 48" size, but it ended up being closer to 42". Yarn: Rowan All Seasons Cotton in Military and Jersey. 14 skeins of the MC, 2 of the CC. 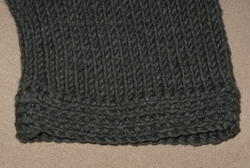 Alterations: I added a crochet ribbing to the hem and sleeve cuffs to make them a tad bit longer, a preference of DH's. I added 1" to the sleeves and 1.75" to the bottom hem. This took an additional full skein of All Seasons Cotton. 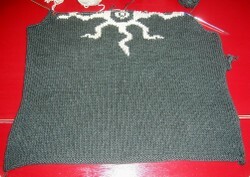 Impressions: The intarsia was not as difficult as I thought it was going to be. I love the cut and look on DH. He really likes it too! He definitely thinks he will get more wear out of this sweater than the other one I made him - simply because it's a cotton blend versus a wool blend, and cotton is more appropriate for San Diego weather than wool is... especially for a man. 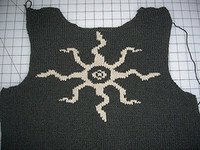 I still need to pick up and knit the collar, and do some blocking. I'm a little worried about the length in the sleeves and body. If blocking doesn't help out, I may knit or crochet a border to add enough length to make DH happy. I have plenty of yarn left over, so that shouldn't be too much of a problem. 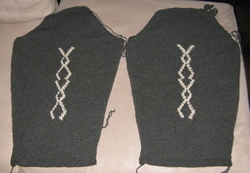 Check it out - the two sleeves of the Tribal Sweater are off the needles and finished! 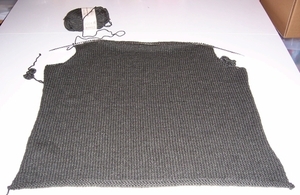 Now to get busy with that seaming and blocking. I've even made a wee bit of progress on the second sleeve! Hopefully I can get this one wrapped up in the next couple of weeks, so that DH can actually get some wear out of it while it is still a bit cool. 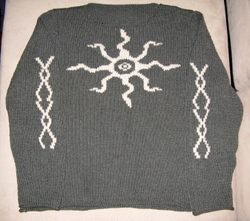 There are a couple imperfections with the intarsia - but that is what gives it it's handmade character, right? 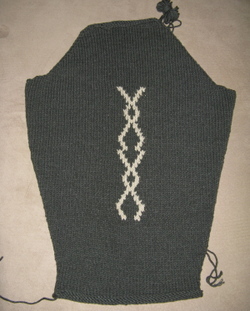 It is coming along quite smoothly considering this is my first attempt at intarsia. My only complaint is that it is kind of fiddly with all those strings hanging in the back... I think I spend more time organizing and sorting them then I do knitting them. It's definitely not a KIP kind of project nor a project I can work on when DH is home. So I'm slowly working away at it when I can take over the entire couch and ottoman, with my yarn strings hanging here and there. I'm surprised my cats haven't tried attacking it yet. I better go knock on some wood or something... I've already had one adventure with a cat and this project, and it wasn't pretty (since I'm kind, I'm sparing you all the details!). Not much progress on the front yet, but with how fast this one comes along I'm sure I'll be ready for the intarsia chart in no time! 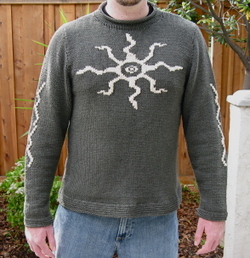 As if the first sweater I made DH wasn't enough to scary me away from knitting for men, I had to go and promise another one! 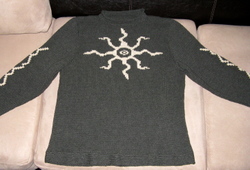 This is it, the sweater DH wants - the Tribal Sweater From Knitting with Balls by Michael del Vecchio. The only condition of this promise was that he had to choose any color except black. NO BLACK, period. So the decision was made that an army-green background and light tan design would be cool. So after a bit of searching, and some email discussion with Kris, I found some Rowan All Season's Cotton in Military (military green - what are the chances of that?!) on ebay for $29.99/bag of ten (from Cucumberpatch... btw they are awesome, I had the yarn in about eight days!). Sweet deal! They also had some ASC in Jersey as well... perfect combination. And the perfect guy colors! It's looking great, and going pretty fast (I owe the speed strictly to learning combination continental, which is great for stockinette). And the ASC is knitting up like a dream. This is my first intarsia project as well. Does anyone have any pointers for when I start the front piece?